Imagine your plan on Holiday in summers to just laid down on the bed and enjoy the resting day with lots of sleep to cover that you missed while working, enjoying and dreaming about the rest and the electricity soon went off to the electricity department is all set to ruin your day with humidity and hot weather. No one wants to trigger that situation but it will surely mess with you at the time of high demand electricity of summer days, the best way to compete with the situation is not to shout at electricity department but to install a top rated functioning and electricity efficient Inverter at your home. If you are buying inverter for the first time it is good to go for a combination of inverter and battery with an option of trolley. Trolley helps you to move your inverter wherever you wish to place it. Home Electric Connection – First check the power grid and electricity connection of your home. Ensure to know in and out of the electric connection established at your home. For example, Air Conditioners need 3-phase electricity whereas normal appliances like Fridge, Blender and Fan need normal electric connection. Calculate the Power requirement – Calculate the power requirement or how many appliances you want to support when power is gone. Measure the requirement in watts. For example, 2 fans and 3 tube lights will need 200 watts of current. So you will choose a inverter that is capable of providing you 200 watts. Service – When you are choosing a brand to buy the inverter, check for the maintenance services they provide as part of the package. Most of us forget to check the service feature and end up in some random repair shop. Choose a brand that provides quick and easy maintenance service. Reputation and Review of the Inverter – Always read reviews online to select an appropriate band. For example, a company that exists in market for 30-35 years will provide good quality products. Avoid inverters that take long time to start. Usually they come at cheap price but eventually lead to damage and waste of money. Avoid buying inverter that still produces power when electricity connection is available. This happens when input power supply of the inverter has problem or burnt fuse or low input voltage to the inverter. Avoid buying inverter where the battery does not charge due to melted fuses and loose battery connection. Thus, to buy inverter, always check for the brand and durability along with compatibility with your power grid at home. Ensure the inverter comes with children/human safety guidelines to avoid any human accidents. The list of top ten inverters available in India with best of use and to offer durability with an efficiently working style that will not add more burdens to your electricity bill will be surely a smart choice. Read the list and be ready to act as smart with all backup options available to enjoy resting day. 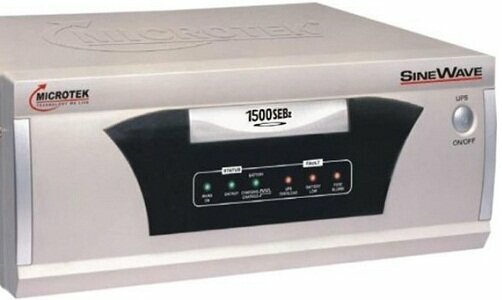 This inverter from Microtek is for a small household and it can work on one battery system only. The inverter is a micro controller based inverter and it comes with features like smart overload sense and short circuit protection which always adds to the value of the inverter. One of the oldest company in India in the sector of home based Inverter introduced itself as the India-based company with its parts and components designed in India as well, The Uniline Energy Inverter offers great working condition with Efficient Star ratings that help to reduce bulky Electricity Bills. Capacity: Smoothly works with Television sets and refrigerator. Features: Indian Company-Uniline Energy and assuring best efficient star ratings. APC shines as the International Brand with known for its high quality power back-up options is the best choice for the customers who don’t want to compromise with the quality. Company’s APC BI850 Shine is the most popular model in the series of backup options available in the market. 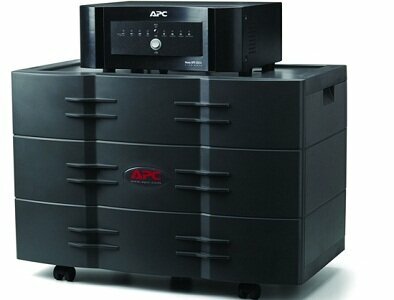 The APC Home UPS is available in the market with different VA range as 650VA, 850VA, and 1000VA. Capacity: VA Ranges offered 650VA, 850VA, and 1000VA. Features: LED indicator with thewaveform of asine wave, Digital Display. Exide enters the UPS market with series of Battery options available as part of UPS Inverters, now it has made its presence count with options available as Home UPS series of inverters. Exide Home UPS carries 15 amp charge current in High charge mode that counts the best feature for long power shedding problems. Variants are available as 650VA, 850 VA, and 1450 VA.
Capacity: VA Range offered as 650VA, 850VA, and 1450VA. Features: Digital Display and attractive modern design. Microtek stands as the leading name in the field of UPS Batteries and UPS inverter, the company has introduced many sine wave inverters but the top seller amongst the list is Microtek UPS SEBz. The best quality about the inverter is its unbeatable price, availability, service, and durability. Features: Efficiency assured worth 80%, protection offered on overload 100% and short circuit 300%. Luminous shares it’s standing amongst the top three UPS manufacturers in India, with a wide range of sales and service network in India. The ‘UPS Sine’ and ‘ion’ are the most reliable inverter options available. Features: Automatic Holiday mode preserves battery charge, Digital display. 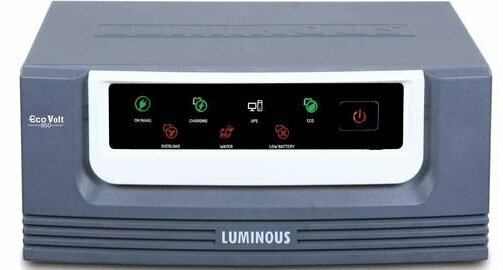 This is another inverter from Luminous and the inverter has a capacity of 1700 VA. It is surely one of the most intelligent inverters in our list and it provides with the information like the time duration of backup that the inverter can provide. Battery maintenance is also easy as it comes with maintenance-free batteries and in addition to this, the inverter also has a feature of MCB Protection and a bypass switch. 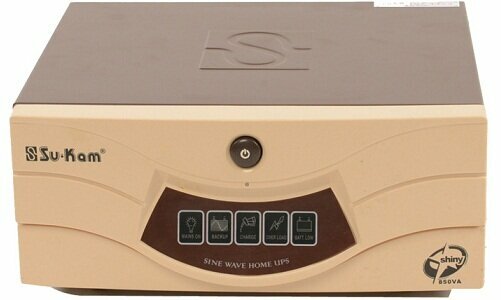 Features: Sine Wave inverter can easily run any heavy duty appliance. The Sukam Shinny series is available in five VA option 250vA, 400vA, 650vA, 850vA, and 1500vA. The 850vA model is the most preferred choice for India’s household usage and built with high quality components which mark it as the model No.1. Features: Fuzzy Logical Control Technology, Extra Protection. 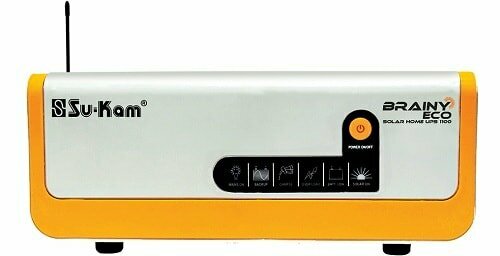 This is a solar inverter from Sukam and the inverter also comes with a temperature sensor. This is one of the most advanced inverters from Sukam and since there is a temperature sensor, the life of battery automatically increases by at least 6 months. You can connect batteries through the AC charging unit so as to charge the batteries and in addition to this, the batteries can also be charged with solar cells and the inverter gives priority to solar charging as that also helps in saving electricity bills. This inverter is for the household which has more number of rooms and the electrical load is too much for a normal inverter to bear. This inverter can easily run the microwave, air conditioner, washing machine and any other heavy duty equipment with ease and it can also provide long duration of backup. In addition to this, this uses two batteries and the charging time of the inverter is 10 to 12 hours. The battery is not included in the inverter price and you can connect any inverter battery to the equipment. Features: Double Battery System, Runs AC and all other equipment. These are some of the best inverters available in the market and you can choose the one which suits your requirement. A lot depends on the load requirements and hence make sure that you do not purchase an inverter which proves to be an under-powered inverter as it will cause a problem. It is always best to purchase an inverter with high capacity as you can utilize the same during expansion of your house.